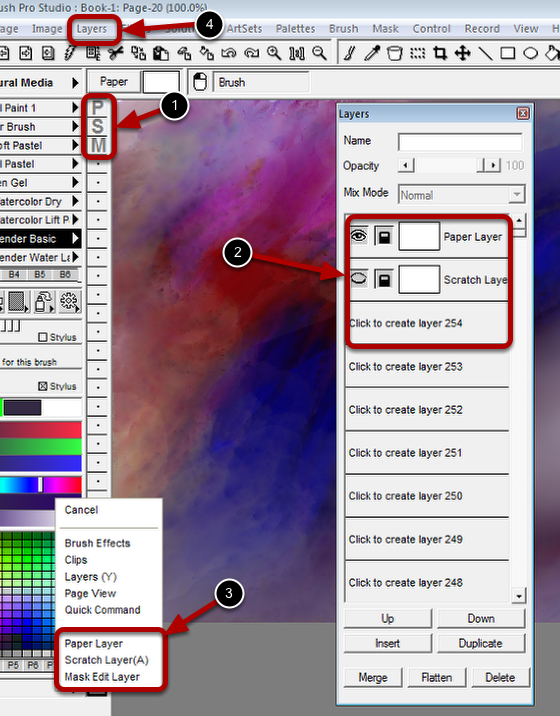 Special layers are layers that act differently then normal layers but are implemented as layers to allow for all the power of TwistedBrush to edit the contents. These layers are the Paper Layer, Scratch Layer and Mask Edit Layer. There is only one of each type of special layer available for any page. When you select a special layer the normal image contents of you page are hidden while you edit the special layer. The easiest way to select a special layer is to use the icons in the layer mini bar. Just click the icon to select the special layer. At the very top of the Layers panel are the special layers. They can be selected from there as well. With in the Panel Toggles pop-up the special layers can be selected. Also from the Layers menu you can select a special layer. All the special layer selections are toggles and all four select methods give the same results. You select and unselect the same way and can mix and match them in any way. For example you can use the method described at 1 to select the Scratch Layer and then return back to your normal image editing layers by selecting a layer or selecting the Scratch Layer again.